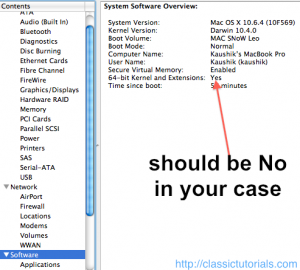 Solved | Snow leopard Freezes or application hangs in snow leopard? I was a victim of the same and figured out the solution on Saturday and have been using my system for 3 days now without any issue. Who should try this hack? If any one is true for you its worth trying. You have recently upgraded your RAM from 2GB to 4GB or above. Your MAC Book Pro or what ever mac machine came with Leopard and you just installed snow leopard from somewhere. You tried formatting and various stuffs still Firefox and Safari hands and various programs becomes "Not responding" and you need to kill them. Thats all. Now open Terminal (Finder and type terminal ) and type the following. sudo systemsetup -setkernelbootarchitecture x86_64 It will ask for your administrator password. Provide it and restart your machine. Voila! Facts: Open activity monitor and see all the default apps has started as 64Bit now.